A full time mother, architect, runner, blogger and now author- Parul Sheth talks to us about how she juggles multiple roles, and also about her upcoming book! Hi Parul! Thanks for taking the time to talk to us! How have you been? Thanks, I have been very well. Actually the last 2 weeks have been easy as I am recovering post my Satara Half Marathon. From this week the training will be on in full swing. You are a full time mother, full time architect, a full time runner and now an author as well! How do you manage to juggle all these roles? Hahaha, that’s a good question. I wonder, too, sometimes. How does all this happen? Actually managing everything takes a lot of planning and multi tasking. Thank god for smart phones! I have a very supportive family and my work is flexible. So I can work my schedule, plan my meetings, site visits and trips as per my convenience. Sometimes when there is work pressure or the children have exams I plan my runs accordingly! Over the years I have learnt to prioritize and as a result each day is a new day for me. The only thing that remains regimented is my sleep hours….I am awake by 5 am and usually drop dead by 10 pm. Everything is packed back to back in between that! Sundays are even busier than weekdays as we do our long runs. After a 3 hour run, some of us runners go out for breakfast. And then I spend some of the day writing. All in all it is always Go-Go-Go! Let’s go back to when you started running. Have you always been an athletic person concerned about fitness? If not, what motivated you to start? Yes, I have always been particular of my fitness, but no, no running at all! In my school days, I played basketball and through college I did aerobics. After that I spent a few years at the gym until the first Mumbai Marathon was held in January 2004. That was a difficult time for me as my husband passed away in the previous September of 2003. So I guess I was looking for an outlet, and there came the answer. I started running to cope with my loss. Personally, how did running benefit you? Running for me started as therapy. The repetitive pounding on the road helped me clear my head. With time and running, I could deal with the pain and come to terms with reality. I feel I have grown tremendously as a person and a runner. Over the last 10 years I have not only learnt how to stand on my own 2 feet but how to run and fly. Who needs wings when you have feet? “Time”, or the lack of it, is always a big excuse for most people to avoid running. What do you have to say to this, especially considering that you have quite a lot on your plate! “Time” has always been an excuse for most people to not do what they don’t want to do. But if one really wants to do something one needs to carve out time for it in the part of your routine. Running is the easiest thing I feel to incorporate in one’s lifestyle as it can be done anywhere (no need for a gym or anything) and it can be done at any time. Being a tropical country, early mornings work best for us. I am out for my run by 5.15 am or latest 5.30, depending on the distance, so that I am home before my daughter leaves for school at 7.15 am. All the domestic chores and work also begins after! So if there is willingness, then all is possible. What is your regular day like? How many hours do you train on a regular basis? After the morning run or strength workouts on the non running days, and all the other domestic stuff, work begins by 9-9.30 am. After a long day and some homework, it is time for stretching and foam rolling. I use this as my TV time! Typically I run for 1-1.30 hours 3 times a week on weekdays, and a long run of 2-2.30 hours on Sundays. So that is 5-7 hours of running and 2 hours of strength in a week. What’s your diet like? Do you follow any particular food plan for you to stay fit and run better? Until the time I used to run Half Marathons I never really bothered about what I ate, except that I ate healthy and avoided fried food. As I have a sweet tooth, a tiny piece of dessert was always waiting for me at night. Being vegetarian, I ate a lot of dry fruits for protein. But since the last few years, when I moved to running the Full Marathon my diet has undergone a change. I eat 3 fruits a day, a lot of mixed nuts and seeds and vegetables. Oats and multigrain rotis have become my staple diet. This food has a low glycemic index which ensures the sustained release of energy. I read that you are busy preparing for SCMM 2015. Prior to a marathon, how does your training schedule change? Do you have any tips to share with others also training for SCMM now? 16 weeks is the peak training period for a marathon. So during that time I will be running 5 days a week. Although most of the running will be at an easy pace, there will be a couple of tough workouts every week to get used to the marathon pace. This will be supported by regular strength training and stretching. My diet will be completely regimented now and I even cut white sugar completely. Also, I start taking a half scoop of whey to supplement my protein intake. As regards tips... I wish there was something that could magically make us run the perfect race! Hard work and discipline is the only way. Run easy and relaxed, but maintain your focus. The way you train is the way you will run your race. Two things are paramount: one…as Savio always says- “Mileage is most important. If your race is 42 km then you have to run at least 60-70km in the whole week! And, two, practice running on tired legs- either an easy run on Saturday and a long run on Sunday, or a recovery run on Monday post the Sunday long run. We love your blog ‘The Running Soul’! You seem to have quite a few followers on it as well. Did you always want to be a writer or was blogging just a way of connecting with the running community? I have always loved English and it was my dream to study English (of course life had other plans for me!) I am an avid reader- although I never thought I would ever become a writer! I used to write small snippets about life and my runs. But the year I started training for my first Full Marathon in 2011, I became a regular blogger and my blog therunningsoul.com was born. As the running grew, I got more and more inspired. My running fuelled my writing! As my posts became regular and I interacted with the readers, I realized that we all have the same fears. We all need to hear the same words for motivation to bring out the best in each one of us! 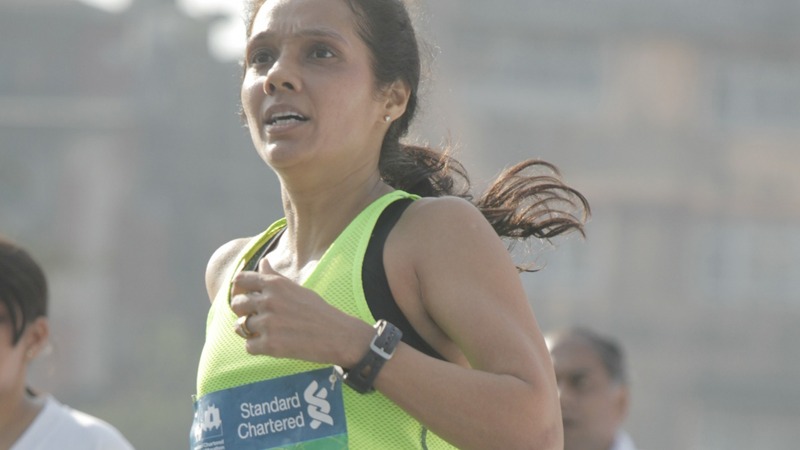 So yes, it is my way of reaching out to new runners to dream big and to give strength to the experienced runners to go through the grueling marathon training. You have just written a book about running as well! Tell us a little about it. The book is a story of how an ordinary person can rise to the occasion and accomplish something they never thought was possible. From a non runner, how I became a Marathoner. It draws parallels between life and running. It talks about how running helped me to become the person I am today. It deals with everyday things like balancing work, family and your passion to make the most of what we have. We need to find our passion and follow it, to squeeze the juice out of life. All of us can’t dream of becoming Olympic champions, but we can surely dream of completing a marathon. All dreams can become a reality if we have courage and perseverance. Where do you see yourself some years from now? Do you have any goals to accomplish or dreams that you are aspiring for when it comes to running? In a few years from now I see myself running stronger and harder! As for long term goals, I think small targets are stepping stones towards the larger ones. So let’s see, hopefully I will be running some international marathons depending on how I do in SCMM 2015. The end of something is merely a beginning of something else. New horizons await me!